This Friday evening (15 September) at about 9:54pm AEST, CSIRO's team at the Canberra Deep Space Communication Complex will capture the final signals from NASA's Cassini spacecraft as it plunges into Saturn's atmosphere at over 111,000 kph. NASA will use Cassini's last fuel reserves to place the spacecraft on a direct course into Saturn's atmosphere where it will burn up and disintegrate like a meteor. The end of the mission is designed to protect Saturn's moons Titan and Enceladus, which have the potential to support life. 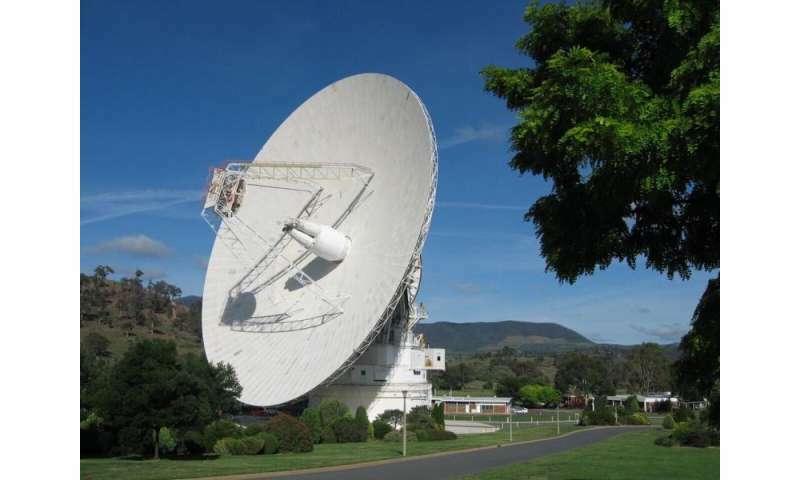 Back here on Earth, those last whispers of data will be captured in 'real-time' by the giant antenna 'ears' of the CSIRO-operated Canberra Deep Space Communication Complex (CDSCC). The station is one of NASA's three tracking stations around the world that provide vital two-way radio contact with spacecraft like Cassini. CSIRO's Chief Executive Dr Larry Marshall said CSIRO had a long and successful history in space. "CSIRO has over 50 years of collaboration with NASA, and designing, building and operating major research facilities like CDSCC and ASKAP, and transitioning space technologies to many SMEs," Dr Marshall said. "Now, our team in Canberra will play a crucial role monitoring Cassini's final hours – its 'Grand Finale'." The Canberra station has been with Cassini through every step of its journey of discovery, from when it first opened its 'eyes' to the Universe after launching in 1997 to receiving the signal confirming that Cassini had arrived safely in orbit at Saturn in 2004. It gave us the first complete view of Saturn's north polar region, revealed giant hurricanes at both of the planet's poles, and showed that the largest moon, Titan, is an Earth-like world with rain, rivers, lakes and seas. Director of CDSCC Dr Ed Kruzins said it was hard to imagine how far the signals from Cassini had travelled. "Cassini's final weak radio signals will have travelled 1.5 billion km at the speed of light to reach Canberra." Dr Kruzins said. "The world will be watching and waiting for that bittersweet moment when NASA's Jet Propulsion Laboratory (JPL) mission control announces 'loss of signal', and we'll know that Cassini's final call home has been made." Dr Marshall said Australia's contributions to global space exploration were inspirational. "Space has the power to transcend generations and inspire endless opportunities," he said. "We study the stars because they tell us where we came from, and inspire us to imagine just how far we might go. "Just as I was inspired as a kid by watching Apollo 11 land on the Moon, today's school kids have the opportunity to witness the spectacular finale of Cassini zooming through Saturn's rings. "The next generation of children will see a brighter tomorrow through the technology we're imagining – and building – today."